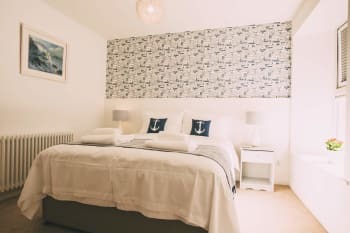 Welcome to No4 St Ives a newly-established Bed and Breakfast in the glorious coastal town of St Ives in Cornwall. 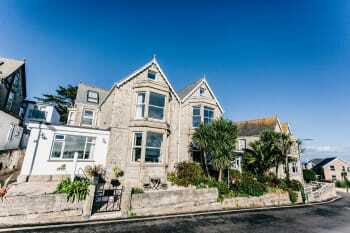 No4 St Ives is a grand, granite Victorian house built in 1898 in a great location within 5 minutes’ walk of St Ives harbour. Offering 8 bright, modern guest rooms all with new en-suites and each with its own individual character. 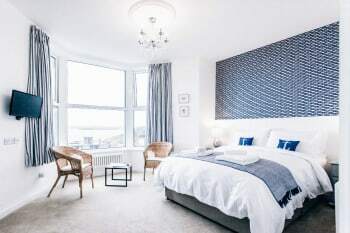 No4 St Ives has spectacular sea views, free WiFi and a private guest lounge overlooking St Ives Bay, across to Godrevy Lighthouse and up the north Cornish coast. Parking: Limited parking is available on site and is free of charge. On street parking is available and is free of charge. Parking is available nearby at a charge of £7.50 per day. The house is beautifully presented and clean. The breakfasts were plentiful and delicious. The free parking was a real bonus. The Rum and Crab Shack has excellent food and cocktails in a friendly, relaxed setting. Mike and Sue are what you call down to earth people that love meeting people . They made my partner and I very welcome with the added bonus of an early check in ! Our room was beautifully decorated clean and fresh . The ensuite had a lovely power shower ,the beddding was adorable as well as the bed . Breakfast was scrumy with fresh fruits and an a mouth watering breakfast to follow . 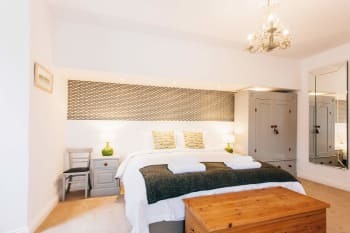 The guest room is a nice touch with views to die for as well as a fridge and cutlery if you fancie a take away like we did ! You honestly can't go wrong here it's in a good position slightly elevated but only a five minute walk and coming up is not a problem . There is a bus service which drops you outside if you struggle with the hill . Like everywhere in st ives you need to walk abit ! With st ives the variety is on your door step . We aren't great sea food lovers which wasn't a problem .Many many restaurants and pubs to eat from steaks to pizzas etc . If coming as I have for 45 years avoid trying to park ! With no 4 you can park . We really enjoyed our stay; it's a beautiful property and decorated throughout to a very high standard. Breakfast was excellent and something for the whole family. The beds were very comfortable and we appreciated all the little extras in the room like bottles of water, tea & coffee as well as shampoo etc in the bathroom (the heated towel rail did come in handy after a day at the beach). We loved the convenient location and it was so nice to be able to walk everywhere. Porthmeor beach and cafe (serves lovely tapas style dishes) Porthminster beach (closest to B&B), very family friendly, has some great water sports on offer as well as a fabulous restaurant (Porthminster cafe - top quality food). Take the train to Carbis Bay (only takes 3 mins) and enjoy another brilliant beach (a little quieter than Porthminster); it has great water sports on offer and a lovely contemporary cafe/restaurant on the beach. Had a great time in a really friendly B&B. Good breakfast with lots of choice, spacious & clean rooms in a really convenient location. Very welcoming and a wondeful place to stay. Our room had a great view over the sea, and plenty of space to relax when not out in town or country. Art galleries and walking the coastal paths. Love the style of this B&B. It is new and the deco strikes a great balance between modern comfort and quaintness. White walls, minimalistic design with a touch of well co-ordinated colours, paintings & ornaments here and there. Very cozy, very inviting. Rooms are spotlessly CLEAN. Tasteful and functional. Hairdryer is provided. Plenty of sockets (with USB ports) to charge all electronic stuff. Coffee & tea available. We were also given fresh bottles of water every day. Owners are very friendly and attentive. Breakfast is great. We could feel the owners have put a lot of heart here. This B&B is really a great place to come back to after a day of intensive sightseeing. Definitely will revisit if we come to Cornwall again. 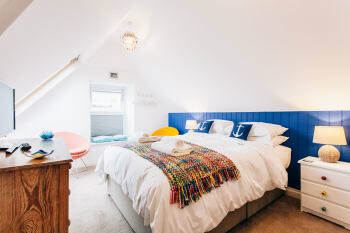 Stayed in room 5, it's smartly converted from an attic and offers great view to the sea. B&B is just minutes from St Ives station / St Ives town so communication is just perfect. Wow - what a very thoughtful and wonderful review! Thank you :-) It is really good to know that all the details and facilities in the rooms that we hoped guests would appreciate, have been by you. We will also pass on your very positive comments to our housekeeping team, as they take a lot of trouble to keep things spotless and comfortable for our guests. Thank you for staying with us and hope you make back sometime in the future! Mike and Sue were incredibly warm and welcoming. Their B&B was beautifully appointed, clean, and comfortable, and their breakfasts the perfect start to the day. We found No. 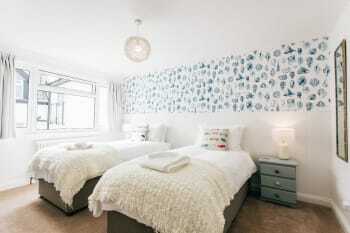 4 the ideal base for a few days break in St Ives, and would definitely recommend it to others. Visit the Leach Pottery, Barbara Hepworth Museum & Garden, Tate St Ives, The New Craftsmen Gallery, Plumbline, The Black Rock restaurant, Moomaid ice creams, and The Fudge Workshop. Wo nderful hosts,nothing too much trouble. Tastfully decorated and extremely comfie,home from home.great breakfast,good selection andtasty cooked one.great hosts. Excellent position for bus and train stations,penzance good to use for bus trips to anywhere!pleasant walk to st.michaels mount,joy to visit,gardens amazing but testing climb. Also up to castle,stiff climb only way up but truly worth it.porthminster kitchen on harbour side,great staff and food with fab views.good walks on the doorstep,as much or little as you want to! Thank you very much for all your lovely comments - it was great to have someone with such a positive outlook on life here. Thanks also for all the helpful tips on the many places you went off to visit by bus around this area and how good the Porthminster Kitchen was. Hope to see you again for a second trip to St Ives! Kind regards Mike & Sue. Warm welcome, generous hosts, beautiful facilities and views...lovely breakfast. Seafood Cafe for excellent fish. Flame and Grill for meat. Leach Pottery for beautiful locally handmade pottery. St Ives Gallery on Fish Street for internationally acclaimed ceramics. Tate Gallery. Amazing B&B lovely hosts. Great decor and comfort. Breakfast first class. My stay at No4 was delightful in every respect- comfort, charm, proximity to town--and most especially the hospitality of hosts Sue and Mike. Barbara Hepworth Museum is a must--as is a walk out to Land's End. Thank you very much for your very kind review and also for the helpful tips for other travellers on must-do's while they are staying here. It was great to meet you and get a chance to talk to you and share some of St Ives whilst you were here. Kind regards Mike & Sue. Sue & Mike were excellent hosts, very friendly & informative. The room (number 1)& view from it was fantastic as was the breakfast! Ate at Cafe Pasta & Pizza very good Italian dishes, Firestone Restaurant had a fantastic steak there & Blas Burger Restaurant excellent burgers for meat lovers or vegetarians. Coastal walk to Carbis Bay & Lelant was lovely, Train ride back from Lelant Saltings Station (£2 each back to St. Ives) nice relaxing ride back! 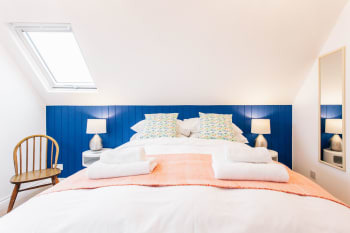 We had a lovely weekend break at No 4 St Ives. Sue and Mike were wonderful hosts and cooked up an excellent breakfast. Room 1 was well equipped with a beautiful view of the harbour and we would thoroughly recommend anyone going to St Ives to stay at No 4. If you visit the Tate and or the Barbara Hepworth House and Gardens, we would recommend that you time your visit for an occasion when there is a Tate Guide to take your around. Owners very friendly and helpful. Excellent breakfasts. Bedroom was very comfortable with a great view over Carbis Bay. Good size car park at rear. We spent 3 nights and thoroughly enjoyed our stay. Had a lovely 3 night stay over the bank holiday weekend. The bed was so comfortable and lovely white fluffy towels. Mike & Sue were great hosts and made you feel very welcome. Nothing was too much trouble. Nice and close to the harbour restaurants etc. We had a lovely walk to Carbis Bay. And to other nearby beaches. We also drove to Godrevy and walked to the lighthouse and saw the seals. Thank you so much for your lovely review. Very pleased that the attention we've given to rooms, beds, towels etc. and to looking after guests was something you appreciated. It was lovely to meet you and you made our job easy too! Thanks also for the tips on places you enjoyed walking to and visiting - always helpful to know what to recommend to other guests. We hope to see you again in the future. A warm and friendly welcome. Beautiful views. Great facilities and fantastic breakfast. Mike and She gave US good advice. Harbour fish and chip shop followed by a pint in the Castle Inn. Other options are available I'm sure. Great to have you staying here and glad you enjoyed your breakfast - always good to hear :-) Thanks very much for your kind comments and tips for others too. Good to see you liked The Castle's beer & Harbour fish & chips combo! Hope to see you here again sometime, Kind regards, Mike & Sue. Thank you very much for taking the time to do this and for such a great review. It was lovely to have you here and very good to get such positive feedback in person and via this review. Best wishes and hope to see you again. Lovely, immaculate, spanking new B&B with warm hospitality from Mike & Sue. The bed is among the best I have ever slept on and the sheets noticeably luxurious. My room and en-suite was very spacious. The guest lounge with sea views is a great place to browse local information, have drinks or snacks, relax or work. Breakfast features a good choice of fresh healthy food, especially berries, and home-cooking. The location is conveniently close to the rail station. Everything in town is within a short walking distance, especially once you know the pedestrian shortcuts between the winding roads. Wi-fi in room and in the building works smoothly. The price was very fair and reasonable for the quality, location and season. 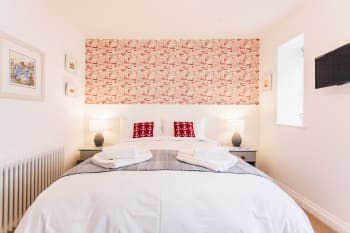 I would heartily recommend No 4 for as one of the best places to stay in St Ives or as a base for enjoying the region. On a bank holiday weekend, make restaurant reservations or go very early. Excellent quality, ambiance and reasonable prices at Porthmeor Cafe in front of Tate St Ives, Cornish Deli, Searoom, Rum & Crab. Moomaid Ice Cream a treat but eat inside or shield it outside or the seagulls will enjoy it before you do. 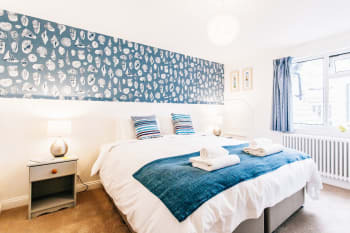 Thank you very much for your two glowing reviews of us and No4 St Ives - it is very good to know that we are giving guests like you a great all-round experience here and that the bedroom worked so well for you. Very helpful comments for us and future visitors on the location, some good local restaurants and also a fair warning of the seagulls love of ice-cream! Best wishes and hope to see you again. Thank you so much for your excellent review. So glad you enjoyed your stay - we enjoyed having you here. Also great to see you rate the coastal path as highly as we do! it's been really quite a lovely stay! we very much appreciated your welcoming and accommodating stance. felt perfectly put.